Celebrate Cider Week with these five fun uses for hard cider. 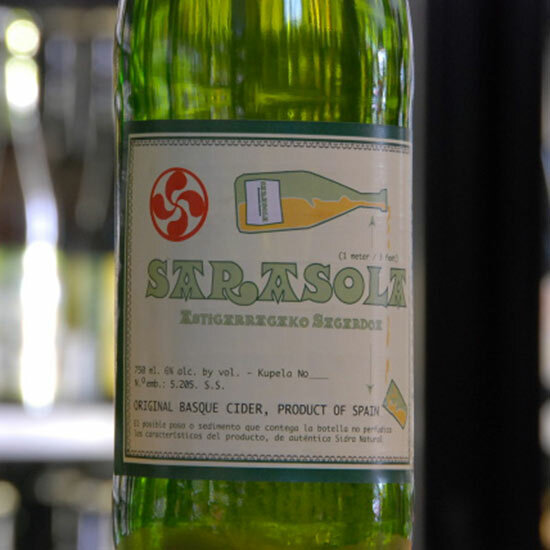 My first encounter with cider was in a Sagardotegi (cider house) years ago, somewhere in the middle of Basque country. I fell in love hard with the slightly funky fermented juice. It was lightly effervescent, tart, yeasty, rustic and dry. Luckily, Spanish-style ciders have gained a big following here in the States so it's no longer impossible to track some down. When you get your hands on a bottle, here are some fun things you can concoct in the kitchen with hard cider. Just remember to pour yourself a glass first. 1. Use hard cider to braise short ribs or a pork roast; it'll help tenderize the meat at the same time. 2. Simmer a cup of hard cider in a saucepan with crushed garlic and fresh herbs until it reduces into a glaze. Brush it on grilled ribs or chicken wings. 3. Whisk some hard cider with apple cider vinegar, Dijon and olive oil for a zesty double-apple vinaigrette that you can use on greens or roasted vegetables. 4. Use hard cider instead of wine in a fall squash risotto. 5. Add some salt, sugar and spices to hard cider to make a tasty brine for whole chicken, duck or turducken.